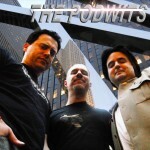 The wits of Pod have the band back together and it feels so good… Brian praises Guardians of the Galaxy ; Dion casts his doubts about the new reboot of Teenage Mutant Ninja Turtles that hits theaters this weekend; and J.- well he does his best not to evoke that name which is not to be mentioned… (Hint: the guy with the big S, and even a bigger hint, it doesn’t work! ). The boys proceed to debate the merits of a good summer movie that has heart, and the crappy tent-pole film that only has one thing on its mind: your money! Plus The Podwits make some HUGE announcements! All that and an all new Borgninian moment! So come give it a spin!